In 2003 Adam Garone of Melbourne and his friends thought it would be funny to see how well they could each grow a mustache for an entire 30-day period. It was at this time Movember was created (Mo being local slang for a mustache) and they really had no idea how their silly idea would soon lead to a global movement. Each of the 30 participating friends started out the month clean-shaven and by the end they threw a party to celebrate their campaign. “We got so much grief from girlfriends, bosses, and moms who said, ‘You can’t just grow a mustache!’,” said Adam. Once all was said and done (and shaved off) Adam and his friends thought, “that was so much fun we need a way to legitimize it so we can keep it going year after year.” Thus Movember truly began to take shape. The group thought about various campaigns they had previously been a party of such as fundraisers for breast cancer research and became inspired by that global community that seems to make such a difference. “Of the original group, two of the guys had dads with prostate cancer so we started researching,” noted Adam. The guys soon found out that prostate cancer was similar to breast cancer in terms of number of people diagnosed each year. They also observed that, “there was a significant gap in awareness and fundraising for that particular cause.” As such, campaigning to raise funds for Prostate Cancer research became the driving force behind the next Movember. In 2004 they then had 450 men from Melbourne and Australia take part, raising $55,000 and this year they are now on track to register over a quarter of a million participants globally. He attributes much of its global success to word of mouth and they had no idea that it would grow to be the event is it today. Across Canada there are already over 1,400 participants or “Mos” each running campaigns or as a part of a team. Locally, Movember Canada funds raised will go to Prostate Cancer Canada while globally the Movember Foundation supports campaigns, education, and research year-round. Upon signup you will be given your own online donation/campaign page, the rule (ie. 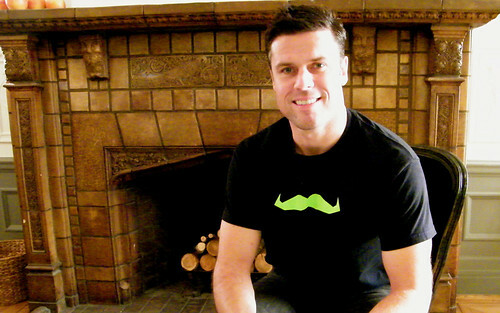 no goatees or beards), and tools to help you raise funds and host events in your city. Women are also encouraged to get involved as they can organize teams, donate, and help mobilize their male friends. Vancouver will celebrate the end of Movember on the 26th at Fortune Sound Club on East Pender. You can come dressed as the character that best suits your ‘stache and there are also prizes for Miss Movember. This will all be followed by what I can only assume will be a massive shave-off. Update: Local company, Saxx is participating and for every pair of their Saxx underwear that they sell this month, they’ll donate $1 to the cause. Thanks for blogging about this! I’m on the Twi’stache team and so far my upper lip just looks dirty rather than hairy. Wow, what a creative idea to raise money for an amazing cause! It’s very inspiring to see that what may seem to be the silliest idea can make such a difference to our communities and future. Great job! Great article. I was at the mo-event today, it was pretty unreal to think that the whole charitable component of Movember was created originally as an excuse to provide to girlfriends, wives and bosses! Thanks so much for adding my donation page to this post. I have to say shaving off my goatee and starting clean shaven has been a shock, but it’s all for a good cause. Again thanks for the support! The Hebrew Hammers are representing Arizona and Las Vegas. There will be a sick gala party at The Palms in Las Vegas for Movember on Dec 6. Come one, come all. Thanks for the post, Rebecca! Some of our BuildDirect guys have started a team as well as a pub night which will raise money for Prostate Cancer Canada. Here’s the donation page. Anyone interested in attending the pub night can sign up here. I’ve been doing this event for three years now and every year it gets better and better. A group of friends have started a team and last year we raised $2000 so this year we’re hoping to double it. Last year we went as Mo risky Mo business. There was six of us in white shirts and underwear for the Cowboys party in Calgary. Surprisingly we didn’t really get many looks as there was a ton of people dressed up for the final party.